Hundreds of shoeboxes must be returned soon to make a difference to someone in need on Christmas day. The Rotary of Calderdale is calling on all those whose who have collected a shoebox in this year’s appeal to return them, filled with gifts, by Tuesday - at the latest. It is vital all the boxes are returned so Voluntary Action for Calderdale can distribute them to various charities which have submitted thousands of shoebox requests for its service users, in time for December 25. Sainsbury’s shoppers Rebecca Hanson and Ann Watson collected their shoeboxes in November. “Rebecca and Ann have now returned their boxes to the store please can the 300 boxes that are still out there to be returned over the weekend,” said appeal organiser Bryan Harkness. 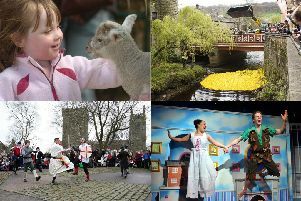 Benefitting Halifax charities include children’s charity Noah’s Ark, homelessness charity Smartmove and recovery charity Basement Project - amongst a host of other Calderdale charities. “The Rotarian team helping Santa this Christmas with the Rotary Shoebox Appeal ask all readers who have not yet returned the boxes to please do so. “Elves and Voluntary Action for Calderdale’s Tony and June, who are hidden away in a large storeroom in Halifax town centre, still have special orders to fulfil for people who need some extra Christmas love and the sooner they have them back, the sooner deliveries can be made,” he said. Bryan, along with a team of Rotarians, will be distributing the shoeboxes to more than 20 local charities. Last year, 2,000 shoeboxes filled with generous gifts of love were given to some of Calderdale’s most vulnerable children, teenagers, adults and elderly. The appeal has received requests for around 2,000 shoeboxes. To fulfill all wishes the appeal is relying on you to return your shoebox, says Bryan. “Think about someone less fortunate this Christmas,” said Bryan. Shoeboxes can be returned to Halifax stores: Asda, Harveys, Morrisons, Tesco, King Cross, Sainsbury’s. Elland: Morrisons. Brighouse: Tesco.